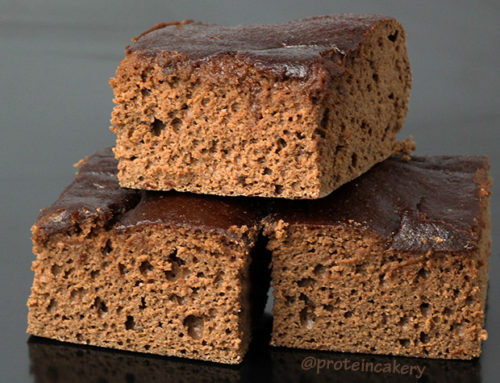 When I first started making protein cheesecake, I started with my aunt’s cheesecake recipe and made some modifications. Her original recipe called for pineapple, but she almost always made it without. With the success of my protein cheesecake recipes, I thought it was time to make a pineapple version, true to Aunt Chubby’s recipe. 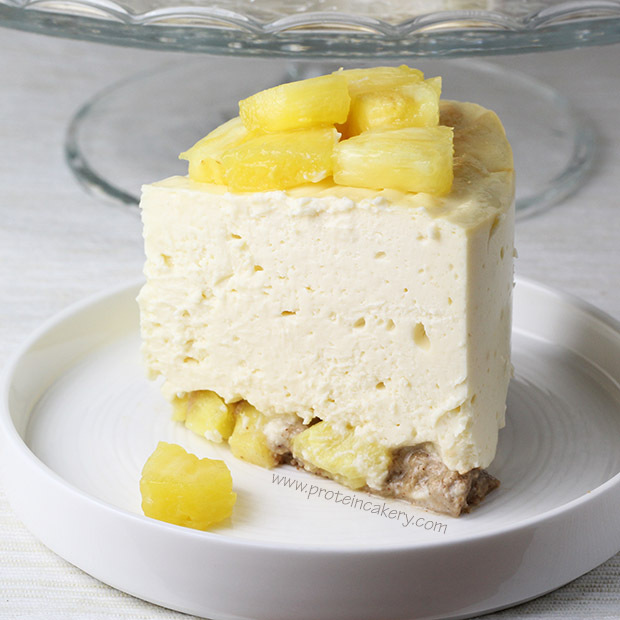 So here you have Pineapple Protein Cheesecake! Cheesecakes can be a bit tricky to get right. So if this is your first time baking one, please take a look at my original cheesecake post for more details and photos of the process. 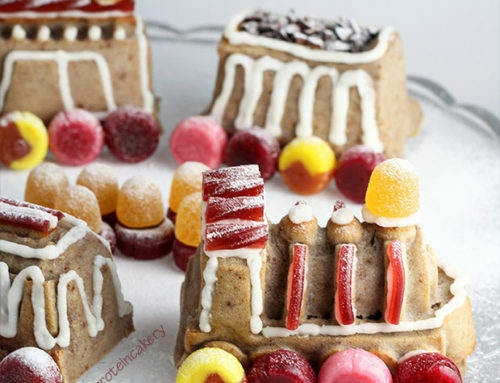 This isn’t one of my easiest recipes, but the results are well worth the effort! I’ve used the Vitamin Shoppe‘s True Athlete vanilla whey protein here. It has a very creamy vanilla flavor that makes for an absolutely delicious protein cheesecake! I’m also using their Next Step stevia, which is my favorite stevia. I have found others to be bitter, but this one I like very much! The team at the Vitamin Shoppe was kind enough to send these over for me to work with. They also do lots of giveaways, so check them out on Facebook and Instagram! 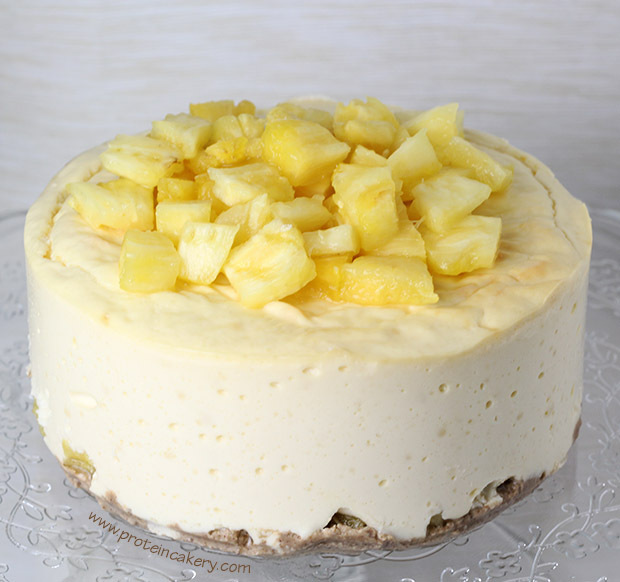 For best results with this Pineapple Protein Cheesecake, you’ll want to use a water bath and remove the cheesecake from the oven before it is completely firm. Although an overcooked cheesecake will taste great, the creamy texture will be lost with the longer bake time. I hope you’ll give this one a try! 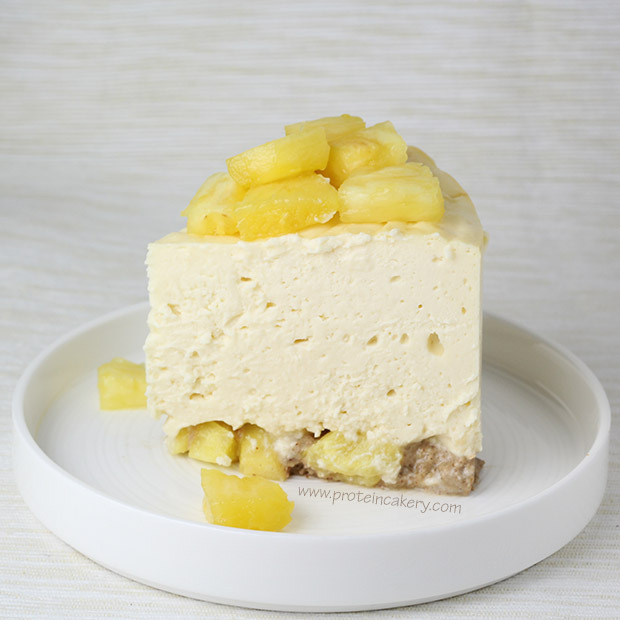 This Pineapple Protein Cheesecake is incredibly indulgent for a high-protein, lower-carb treat! Prepare your 6" springform pan by lining the bottom with parchment paper, and brushing the sides with coconut oil (or non-stick cooking spray). Wrap the bottom of the pan with aluminum foil. Press into the bottom of the springform. Top with about ½ cup pineapple chunks. Set aside. Using an electric mixer on medium speed (for a Kitchen-Aid type mixer) or low speed (for a hand-held mixer), cream the Neufchâtel cheese. Add stevia, and continue with mixer until well combined. Add eggs, one at a time. Continue with mixer until well combined. 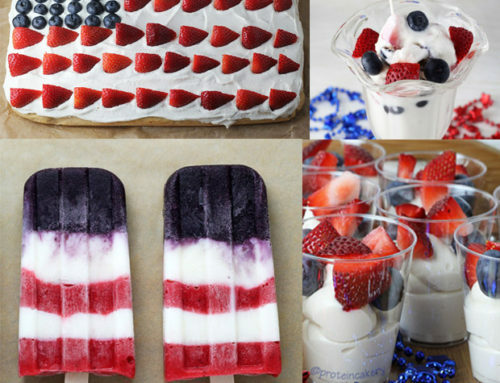 Add Greek yogurt and vanilla. Continue with mixer until well combined. Add whey powder. Continue with mixer until well combined. Bake for 30 minutes at 325F (163C). Then reduce the temperature to 200F (93C) for about 35-40 minutes. The cake should be firm around the edges, but the very center should be jiggly. The cake should not be browning on top. Refrigerate for several hours (cake will continue to set) before serving. Top with remaining pineapple before serving. Enjoy! I used fresh pineapple, but canned would also be fine. Just be sure to drain the juice from either so you don't get a soggy crust!